Wooster geologists Terry Workman and Greg Wiles are joined by Alena Giesche (Middlebury College), Jessa Moser and Tom Lowell (U. Cincinnati) on Alaska’ Kenai Peninsula undertaking paleoclimate research. We are coring lakes in collaboration with The Kenai National Wildlife Refuge to get a better understanding of climate change and precipitation changes since the Ice Age. Alena archives another meter of sediment as Terry looks on. Ben Edwards arrived from the States today. After a short morning of getting acclimated, he and the Wooster crew headed out to the field with our Icelandic colleagues, Steina and Hauker. We visited 3 quarries that expose the internal architecture of 2 different pillow ridges. Pillow ridges form during subglacial eruptions, where the the ice melts and the lava is quenched. Thanks to the heavy machinery, we are able to see natural cross sections of the ridges, and we’re observing a lot of unexpected details. Most quarries show nicely preserved pillows, with radial cross sections and glassy rinds. Vesicles appear in a variety of patterns, sometimes concentrated in the center of the pillow or in concentric zones around the center. Surprisingly, there are a lot of intrusions as well. We observed one of the best examples of a feeder dike in contact with its lava flow. There were also some irregular and sheet-like intrusions that stood out against the wall of pillows. Clearly, there are a lot of questions to be answered here. Todd is going to address some of those questions in his I.S. 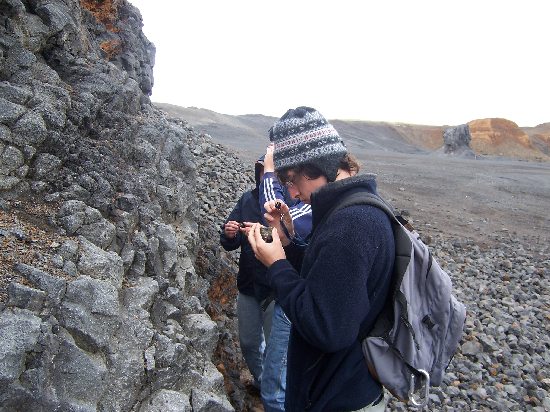 Adam using a hand lens to identify phenocrysts. 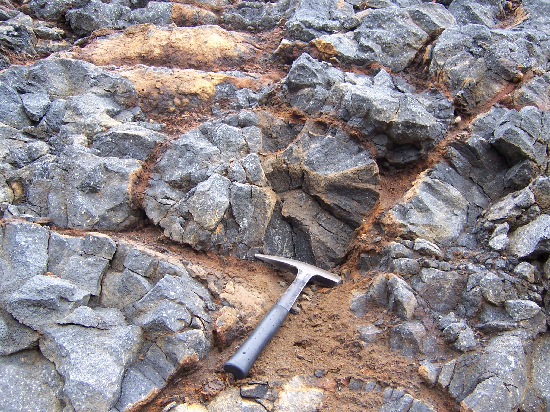 Pillow lavas with a hammer for scale. Notice the radial joints. The pillows are surrounded by brown, altered glass. 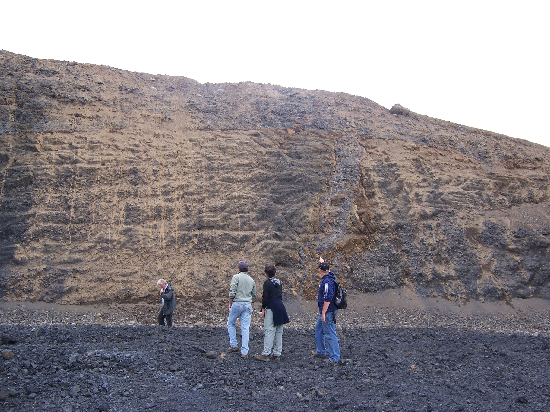 Todd (on the right) is pointing to a light gray dike that intrudes through black, glassy, brecciated material and feeds an upper unit of gray pillows.